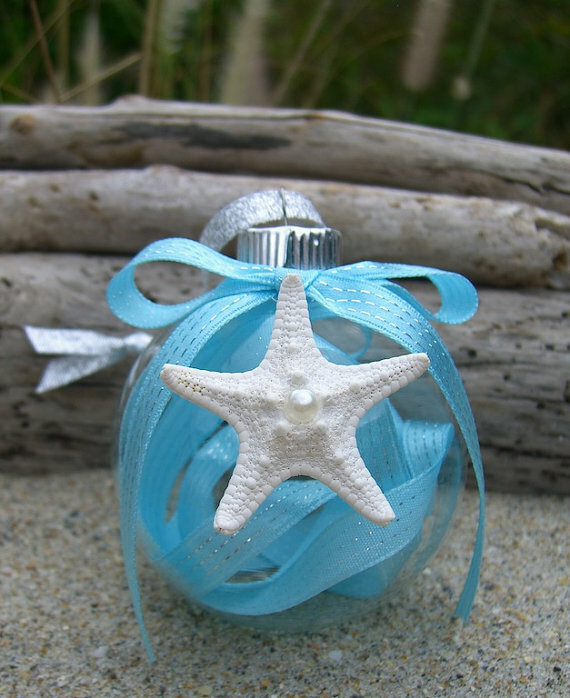 Christmas is such a magical time, and Beach Christmas Ornaments are the perfect festive decor to surround yourself with as a beach lover. Apart from looking stunning, they will also remind you of what you treasure so much. There are so many ways of decorating for Christmas in a coastal and beach style that at the same time will look very festive and serene. 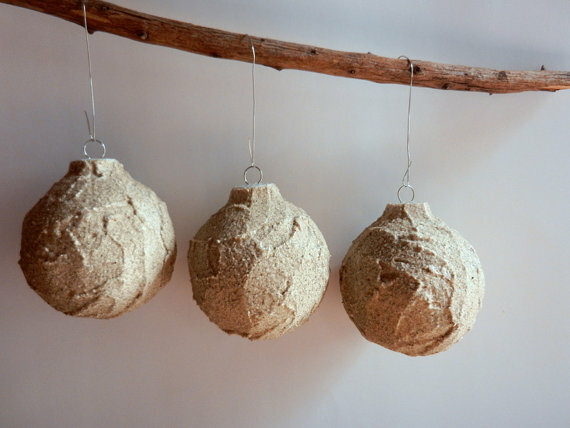 And it all gets even better if you can maybe be creative and do some DIY decor. 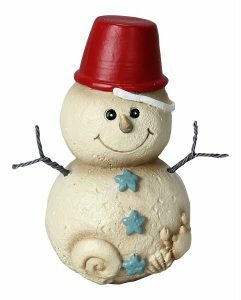 Here are a few inspirations on ways how to decorate your Christmas tree with Beach Christmas Ornaments, and many of them you can also do yourself. This sea urchin Christmas ornament set looks just magical and consists of 4 sea urchins with ribbons to attach them to your tree or wherever else you want them. 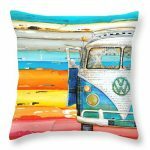 They are hand made and are available at Beach Grass Cottage. If you have been lucky enough to find sea urchins on the beach, why not try to make them yourself? 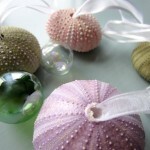 This set of 4 sea life Christmas Ornaments have been lovingly created by hand and are available at SandNSurfCreations. 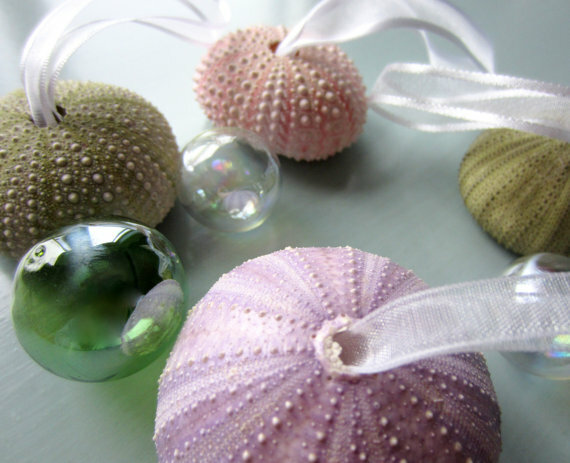 They are made by layering some nautical rope inside clear baubles and then decorating them with different sea life like sea stars and sand dollars. Imagine what they will look like with different kinds of blue or gold ribbons…! A nice piece of driftwood will always be a perfect way of displaying ornaments like these baubles, or also Japanese Fishing floats; thinking of Christmas, you could easily hang some red and blue fishing floats from a driftwood branch – it would look stunning! 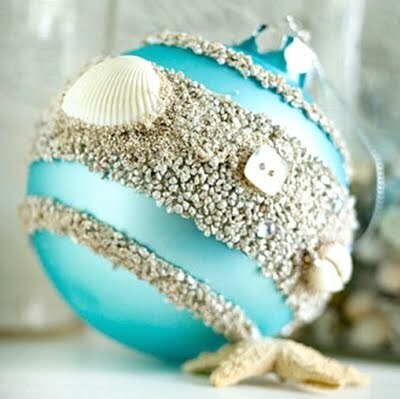 To create this very festive Beach Christmas Ornament you need to start with a basic bauble in a color you like (obviously, choose one that fits in with the beach theme – like blue, white, sandy color). You then simply paint on glue in a pattern that you like and pour beach sand onto the glue. The finishing touches can be done by gluing on small shells wherever you like them. Beautiful, right? This can be found on Better Homes and Gardens. 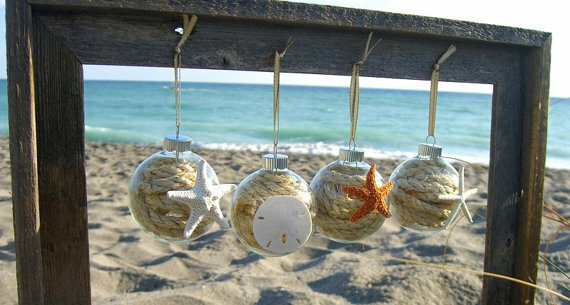 Happy decorating with Beach Christmas Ornaments!